Manufactured Homes | What Buyers Need To Understand When Purchasing a Manufactured Home? Home » What Buyers Need To Understand When Purchasing a Manufactured Home? For those homebuyers considering purchasing a manufactured home, get prepared to have your preconceived notion on how these modern-day marvels of technology are built, used, and welcomed by both the marketplace and the general populace at large. Manufactured Homes – The quality of today’s manufactured homes is nothing short of amazing. Utilizing many of today’s technological advancements, the modern manufactured home is usually a single-story unit. Often with the option of a doublewide or triple wide design, and complete with amenities that evoke a warm “house-like” quality, the old-school notion of grandma’s single-wide “trailer” is a passé concept. Delineating the old from the new – today’s modular homes are constructed with steel I-beam chassis. Complete with wheels, today’s manufactured homes have been designed to be towed to their final destination. Prefabricated Homes – A general expression utilized in referencing any type of prefabricated home that has been built off-site (read: factory or offsite production plant) and once completed transferred to the buyer’s home site location. Mobile Homes – The term “Mobile homes” is a throwback to the Nixon era. A term that applies to modular homes built before June 1976, after which time the Federal Manufactured Home Construction and Safety Standards were established (a code provided by HUD) elevating the standards and guidelines currently utilized in the production of manufactured homes. 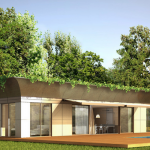 Modular Homes – are constructed off-site and are generally built in multiple sections at a factory. Then, after much planning, are usually transported to the buyer’s building site. 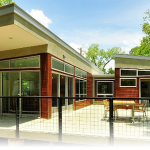 Constructed to conventional building codes, these modular homes enjoy many of today’s current advancements and designs; similar to the more expensive stick built homes. Complete with multilevel floor plans and a more traditionally pitched roofline, these homes are hard to differentiate from the more conventional site built homes. Manufactured Home vs Site Built Home? Myopically focused on the modern manufactured home, let’s drill down on what the exact advantages are of today’s homebuyer purchasing a manufactured home? First and foremost, the manufactured home costs significantly less to build. Additionally, they’re much faster to put up and make livable. Steeped in modern-day amenities, there is no sacrificing luxury in the modern double- and triple-wide manufactured homes of today. Featuring modern designs and saturated in elegance, today’s manufactured homes offer ample floor space and upgraded amenities. Without a doubt, purchasing a new manufactured home is going to be much more affordable in the short term, however there are some considerations to think about. In the past, some of the major lending institutions had shown reluctance in providing a financial product for any manufactured home that wasn’t placed on a permanent foundation … or on land that was owned outright by the home buyer; that has thankfully changed. Doors and Windows: Are they well insulated? Keep a watchful eye out for energy wasting gaps around the frames. Look any defects and make sure the Windows seal properly. Be sure to test the doors; make sure all open and close easily. Squeaking Floors: Make sure there’s no squeaking or sagging! Test the floors strength and look for any unusual warping due to insufficient fastening. Please… avoid all floors built from particleboard as it rots and warps when exposed to moisture. Moisture Wrapped: Look for a thick plastic polyethylene sheeting used under the floor and insulation, utilized to keep moisture and critters at bay. Be sure to inspect the integrity of the insulation under the wrap, making sure it’s not moist. The bottom line here is simple, purchasing a manufactured home is a big obligation and investment – so do some research. Investigate all of your possibilities, and don’t be afraid to ask questions as they relate to safety, construction, and finance. Remember, “Caveat Emptor.” Not all manufactured homes are built equal.